Success! Samuel from Kenya raised $1,050 to get healthy. 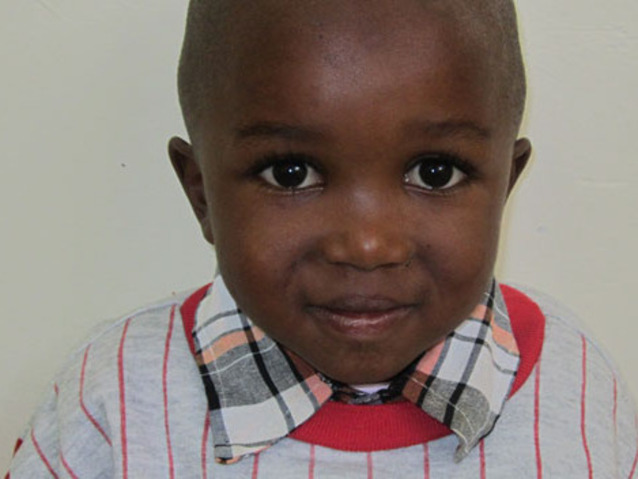 Samuel's treatment was fully funded on February 15, 2013. Samuel is a little boy who his doctors describe as “a bit shy but full of life.” He lives with his parents and his grandmother in a small village. Samuel’s family has big dreams for him. None of them were able to study past primary school due to lack of finances, so they talk nonstop about one day seeing Samuel in a graduation gown. Samuel is just about at the age where he should be starting school, but an injury threatens to stand in his way. Three years ago, when he was less than a year old, Samuel dipped his hand in a pot of boiling water and suffered severe burns. Since then, Samuel has developed scar contractures, which have resulted in the dislocation of his finger joints. He is now unable to use his right hand. Without treatment, it will be difficult for Samuel to do everyday tasks, including write in school. The surgery Samuel needs to repair his hand costs $1,050. His parents work hard to provide their son with the basic things he needs to live a happy life, but it would take them years to make enough money to pay for this specialized treatment. We hope to raise the money needed to enable African Mission Healthcare Foundation to cover the cost of his care and allow Samuel to thrive. Samuel's case was submitted by at African Mission Healthcare Foundation in Kenya. Samuel's profile was published to start raising funds. Samuel's treatment was fully funded. Awaiting Samuel's treatment update from African Mission Healthcare Foundation.